All the. Outs. In Free. Oxenfree is a tremendous achievement in Lovecraftian story-telling, despite not being based on the works of Howard Phillips Lovecraft. Note: This article on Oxenfree does not discuss the ending, but does allude to several key moments and major reveals. Normally I wouldn’t include a spoiler warning, but as Oxenfree is both a story driven game and a recent release, I feel it prudent to include one here. 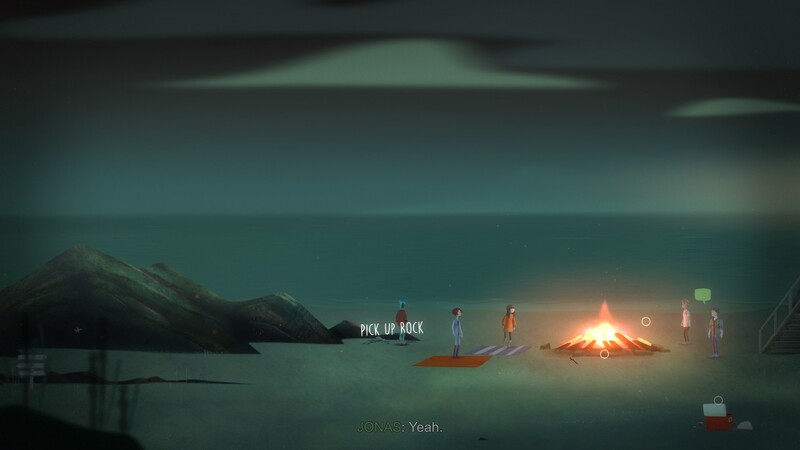 Like any good ghost story, Oxenfree starts with a campfire, beer, and five friends alone on an island. I threw a lot of rocks during a game of Truth or Slap. 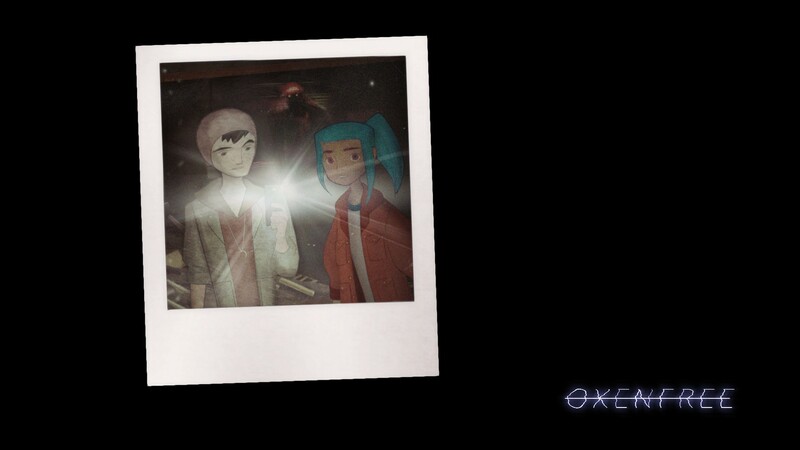 In Oxenfree, you play as Alex, a young teenager approaching her senior year of high school who suddenly finds herself with a new father, and a new Step-brother who came with him. Alex invites her new brother Jonas to Edward’s Island, for the annual school tradition of getting drunk on a beach all night. Alex’s best friend, Ren, has asked her to bring a radio along this time, because he’s found some unusual signals near the mouth of a cave he’d like to show off. So he takes you to the cave where you can pick up distorted messages, the friends drink all night, and everyone goes home to prepare for prom and finish college applications. ...But you and I both know that’s not how this story ends, right? As Alex, it’s up to you to face the horrors unearthed by your unadulterated radio cycling, all while trying to balance tensions within your social circle over the course of the night. Night School Studio was founded by former Disney and Telltale developers, and it shows in the quality of design, writing, and mechanics. Each character has a tremendously unique wardrobe style, speech pattern, and voice. This is a great thing, because aside from occasionally tinkering with a radio, the majority of Oxenfree is conversations with the cast. Alex usually has three dialogue choices with each prompt (four if you count saying nothing). Many of these choices have no immediate consequences, serving mostly as banter while you travel across the island, but every now and then you’ll be asked to make major decisions. Even with the smaller, less impactful choices, your friends will remember what you say -- and what you do -- all night. And so will the ghosts. In Oxenfree you’re always being tested, even if you don’t always know it. 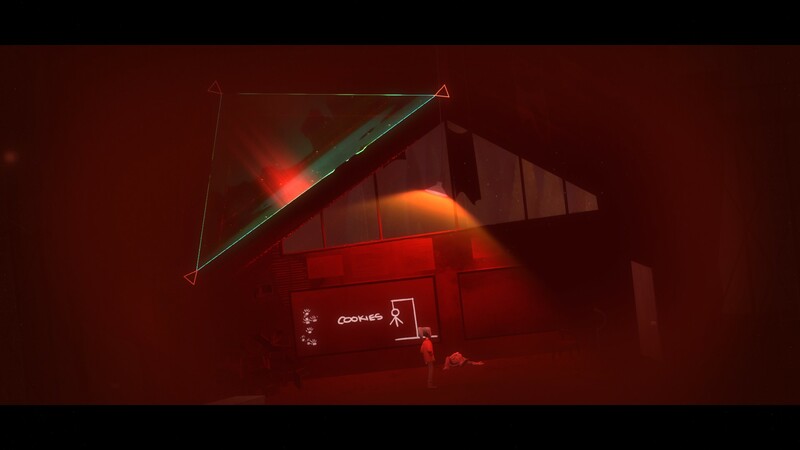 Oxenfree is a game all about the forces larger than ourselves, both imagined and real. In the face of the world, our humanity is weak, frail. Delicate. People can vanish from our lives in seconds, leaving behind only echoes and memories. We were lucky on this planet to be the apex predators, the first to greatest sentience, tool use, and size... but what about things not from earth? How do we stack up on a cosmic food chart? 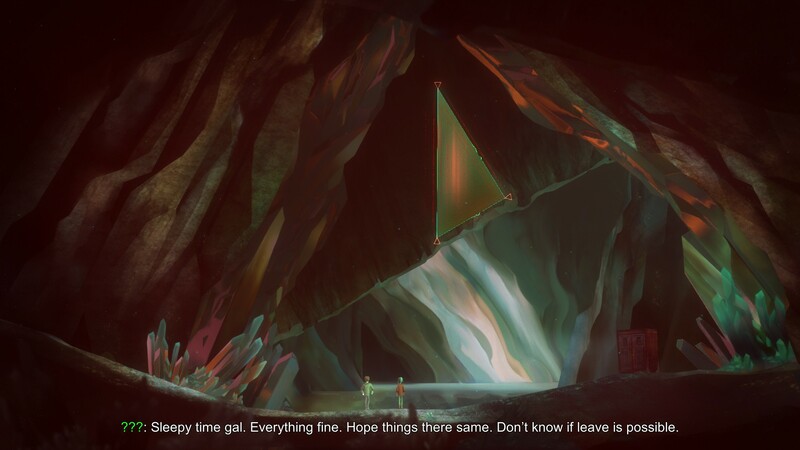 Oxenfree’s setting hammers home this theme of feeling small and insignificant. Character models remain tiny and distant, centered in the frame, while the world around them appears vast. Everything towers over you, like Edward's island might swallow you up at any minute. This pays off big once the spooks begin to play. Like any good lovecraftian horror, these creatures exist in the periphery of your senses, flickering in and out of existence. Whenever they inhabit your friends, using them as puppets to speak through, their true forms appear on the sidelines of the world, as tall as skyscrapers, constructs of signals and energy who never quite appear whole. These ghosts, these otherworldly horrors, reflect the other grand, abstract forces at play among your friends. The end of high school is a tumultuous time, where friends are guaranteed to be thrust apart by college, and this group of friends is not-so-silently aware this time is approaching. The future is some big, scary thing on the horizon. Speaking of big, scary unknowns, The frailty of humanity is already something the cast has dealt with prior to the events of the game. Jonas lost his mother prior the events on Edward's’ Island. Alex lost her brother. Clarissa lost her boyfriend -- who also happens to be same family member Alex lost. 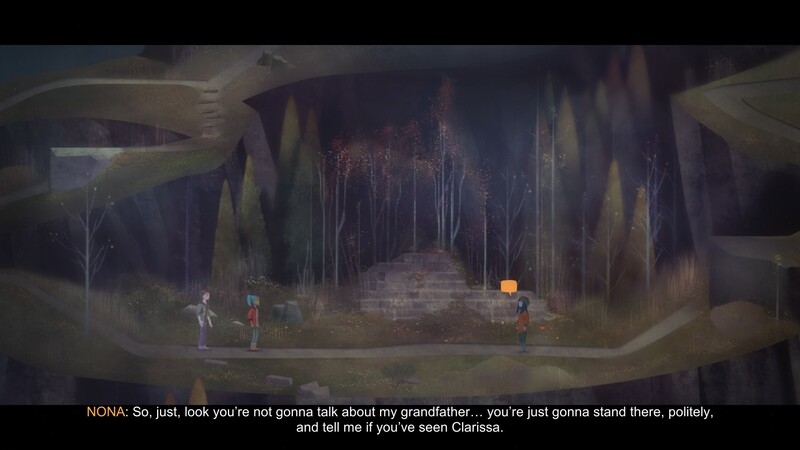 Watching characters respond to and deal with loss is not as uncommon a theme in games as it once was, but Oxenfree treads unique territory with how the creatures use it against them. The greatest weapon the ghosts have against this motley crue is their past. When possessing a body, they send the subject back to relive moments from their past, moments they hold fondly of departed friends and family. Alex and Jonas’s shared experiences with loss can either be a bond or a dividing wedge, depending on your answers. And how do you fight against something you don’t want to fight? How do you give up a chance to see the dearly departed once more? 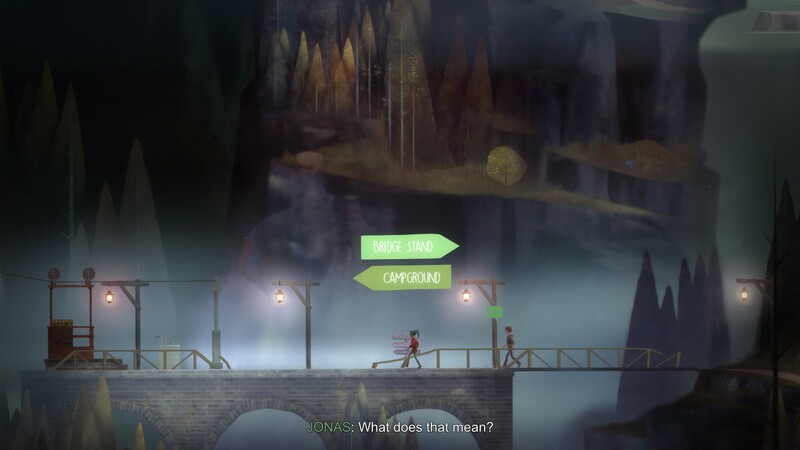 Plenty of games these days toy with how death and loss affect us, but Oxenfree touches upon a delicate topic: How it can affect us for the worse. How obsessing over the past can take our eyes off the future, halt our progress, as we linger in empty nostalgia. For the ghosts, it’s the ultimate weapon they have against you and your friends, the easiest way to keep you from struggling. The best weapon they have against you isn’t your mortality, it’s complacency. And when it becomes clear how much danger your tiny crew of beach partygoers is in, it becomes a whole lot harder to care about the next school dance. When the night starts, Clarissa’s lousy attitude is your biggest problem. 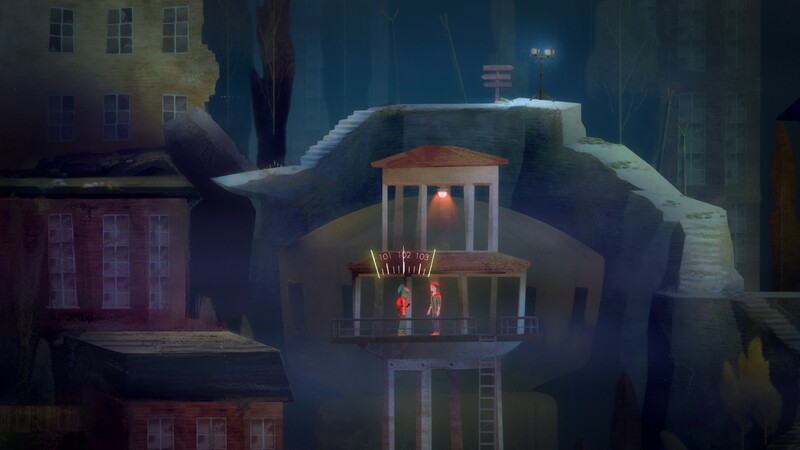 I only really have two criticisms to share about Oxenfree, and one of them is minor at best. The first issue is the collectables scattered about the Island. These are entirely optional, so I feel this is a minor point, but these are obtained by finding the appropriate radio signal, then standing still for a while to listen to the entire journal entry. There’s no guide on where to find them, which the scavenger hunter in me appreciates, but thinking narratively, the idea Alex would halt her extraordinarly time-sensitive mission to save the world in order to track down a few journals... problematic. To be fair, they’re presented before the first mystery is solved and the stakes hit a catastrophic level, but beyond this moment, when urgency is a huge factor, it becomes tricky to justify. The other issue is Nona. All the characters on the island serve an important role, both in their skill sets and in the dynamic of the group. Nona though, does comparatively little. There were times I felt she was present just to be a romantic interest for Ren, and even then it mostly feels she’s along for the ride. There’s only one sequence where Alex can spend time alone with Nona, and this moment too is entirely conditional on Alex choosing her as a partner for the next leg of the journey. I wouldn’t go as far as to say the story would be better without her -- The closer nature of her friendship with Clarissa and her soft spoken demeanor makes for a nice contrast to the rest of the group -- but I do wish she had more moments as an active agent. 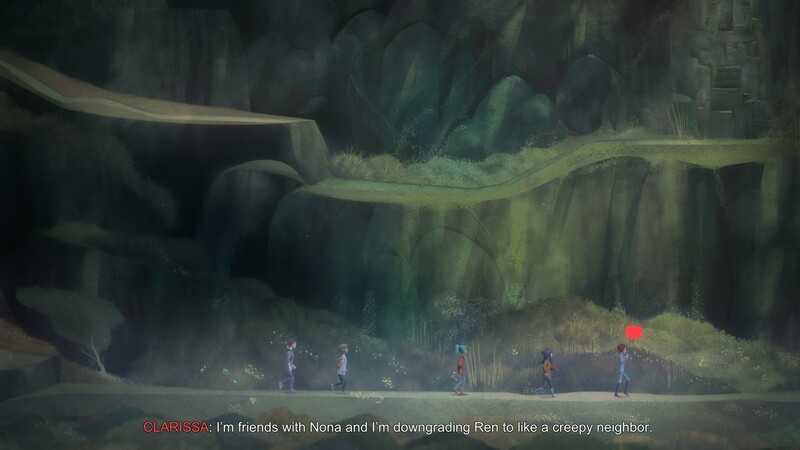 After two playthroughs, I couldn’t help but feel Nona went underused. In Stephen King’s Danse Macabre, a book about humans and their love of fear, the king of horror outlines three types of terror. The Gross-out: the sight of a severed head tumbling down a flight of stairs, it's when the lights go out and something green and slimy splatters against your arm. The Horror: the unnatural, spiders the size of bears, the dead waking up and walking around, it's when the lights go out and something with claws grabs you by the arm. And the last and worse one: Terror, when you come home and notice everything you own had been taken away and replaced by an exact substitute. 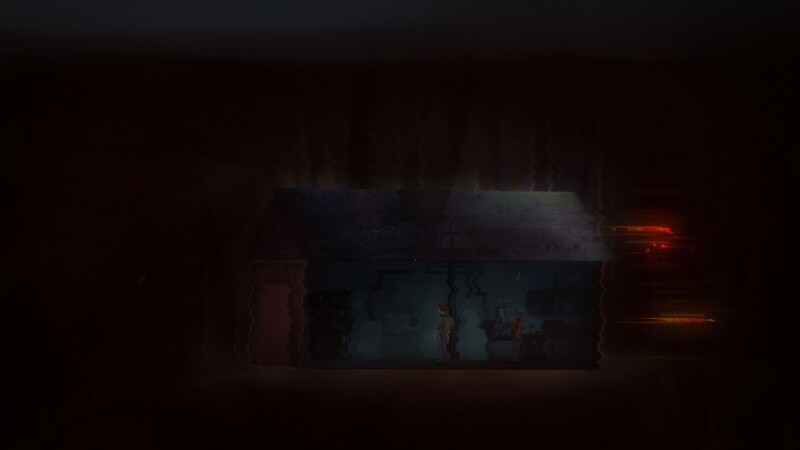 It's when the lights go out and you feel something behind you, you hear it, you feel its breath against your ear, but when you turn around, there's nothing there..
I’ve played many games that accomplish the first two (the first Dead Space comes to mind) but very few that accomplish the last. Oxenfree lives in it. Nothing is as it seems on Edward’s Island, and the events of the game only further compound confusion upon confusion. Even when things are calm and normal, there’s a sense of dread, a lingering fear everything could go wrong when you take the next step. Oxenfree does a genius job making you feel small and ill-equipped, even when nothing dangerous is immediately happening. The ghosts have possession, non-corporeal forms, and time manipulation. You have a radio. And, if you’re sitting there, feeling tough, confident, and in control, perhaps you need a reminder of your frail humanity. As you read this, your lungs are pumping air in and out, constantly, because your body cannot go more than a few minutes without oxygen. Your eyelids need to blink to coat your eyeballs with tears, because your eyes have inadequate moisture control. Your entire nutrition system is so inefficient, you must eat three times a day -- and still most of those resources go to waste. Your eyes, nose, and sense of taste deprive you of information necessary to your survival. There are gasses that could kill you in one whiff that you cannot see, taste, or smell. Entire generations of canaries lie dead in coal mines, a grim reminder of our feeble senses. So next time you find yourself in the car, facing a long drive, with your bluetooth acting strange or your phone dead, and you start fishing for a radio station in an unfamiliar place, should you come across static, static that sounds not unlike words, do humanity a favor. Choose the words you speak back very carefully. Oxenfree is available on Steam and Xbox One for $19.99, with a PS4 release at a later date.